February 23, 2016 - The Gorman Bros. operations have come a long way since the two brothers, John and Ross, opened up a factory to build fruit boxes out of sawmill scraps more than 60 years ago as a way to earn a living while their fruit orchards recovered from a harsh winter. Although the original office for that factory still stands proudly on display at the front of the Gorman Bros. sawmill and planer mill facility in Westbank, B.C., everything else related to the company’s operations has changed to adapt to the competitive pace of the forestry sector. The Westbank facility is a one-inch board mill that sells into 28 different countries worldwide. The mill produces 150 million bdft. predominantly out of spruce and lodgepole pine. Some lumber companies consider Gorman Bros. a “boutique mill” and that suits Doug Tracey, operations manager for Gorman Bros., just fine. The reason Gorman Bros. has such a great reputation? One word, quality. The company’s desire to produce top quality boards is one of the reasons for the company’s latest investment in its planer mill, new automatic grading equipment. 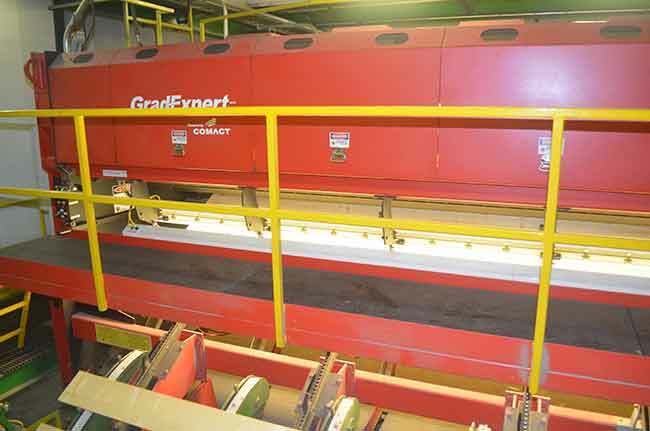 For the upgrades, they turned to Comact and its GradExpert automated grader. Choosing the supplier that was the best fit for the company wasn’t an easy task, since most of the optimizing and grade scanning companies that Gorman Bros. management sat down with didn’t have a lot of experience in grading one-inch appearance grade boards, Tracey explains. “The level of detection that they required was so much greater on the one inch to see everything visually that needed to be looked at to grade one-inch boards accurately,” he says. 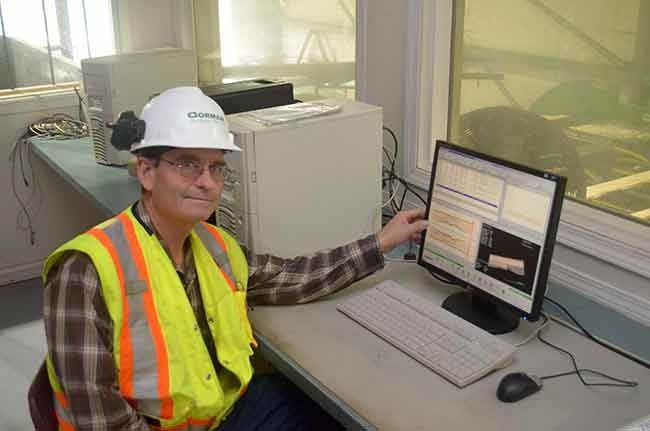 The first GradExpert automated grader system the company purchased was sent down to the company’s facility in Oroville, Wash. for testing. Glenn Griffin, the company’s quality control and project analyst played a key role in making sure the company understood what criteria it was looking for from the grading system. The different species of trees Gorman Bros. uses in its operations were another factor in selecting Comact equipment. The company uses mainly spruce and lodgepole pine in its Westbank operation, and the loose knots need to be graded differently. To help manage this aspect of the operation, Comact installed species detection. “Now we can detect the species and apply the grade rule, so that was a big step for us,” Griffin says. the company’s quality control and project analyst looks at a solution for the Newnes Edger Optimizer. Three LeTourneau Technologies log loaders unload logs in the yard, which are transferred via Caterpillar wheel loaders down to the company’s slasher deck, which was custom built in the early 1980s. The logs are then transferred via step feeders over to a Nicholson double-ring debarker. If the logs are over 14” then they go to an HKS Engineering designed head rig, equipped with a McDonough Manufacturing carriage. Otherwise, they are sent to the company’s Optimil double-length infeed (DLI) canter line, the main production line for the facility. A 72” bucking line processes the bigger logs and crooked logs before they are transferred to either the head rig or canter line. Linden step feeders are used to feed the debarkers for both the head rig and canter lines – a Forano debarker for the canter line and a 36” Cambio debarker for the larger head rig logs. One operator in a clime-controlled operator station runs both debarkers. “We’re running about 50 per cent spruce, 50 per cent lodgepole pine,” Griffin says. On the canter line, the logs are then sent through two scanners. Two scanners were installed due to a lack of available space within the sawmill. The scanners are married together to get the whole picture for the log. The cants are sent out to one of three Ukiah gang edgers, a 4” gang edger, an 8” double arbour gang edger or a 12” double arbour gang edger. The company currently runs about 6,500 logs through its Optimil DLI canter line, every shift. The company runs three shifts, 24 hours a day, five days a week. The wood then moves to the drop sorter who sends it to the J-Bar or the company’s two Newnes (USNR) laser scanning, two-board decision edger optimizers. “We have two edger optimizers because about 50 per cent of the pieces have to be edged,” Griffin explains. The boards then go to a Newnes (USNR) trimmer optimizer that performs the geometric scanning and grade scanning of the boards. A four-stage fence system positions the boards, which then go through a multiple-saw trimmer. The boards are then transferred to Newnes (USNR) 75-bin sorter system where they are sorted by different grades, lengths and widths. Boards are then sent to a Mill Tech Industries stacker with automatic stick layers. 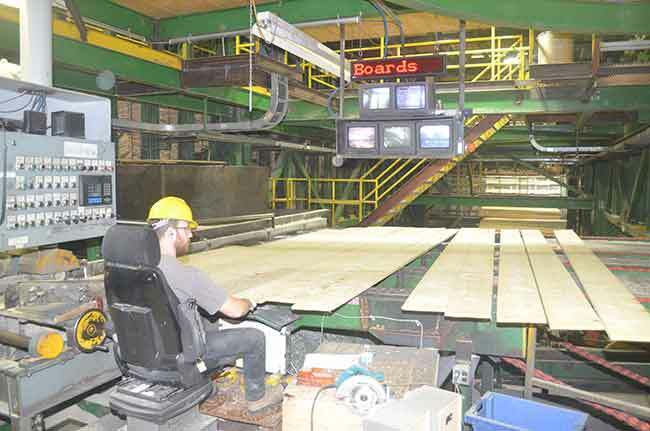 Boards sent to the planer mill are processed by a six-head, high speed Waco planer that runs 1,000 feet per minute. In order to get the full scan of the board with the Comact GradExpert, Comact installed an extra set of cameras and transfer chains so nothing blocks out any part of the board. The line can run upwards of 120 lugs per minute. Based on the characteristics, the GradExpert applies the grade rule set up by Gorman Bros. and then transfers the information over to the PLC for the trim decision or cut-in-two decision. A grade stamp is then applied on the end of the board. 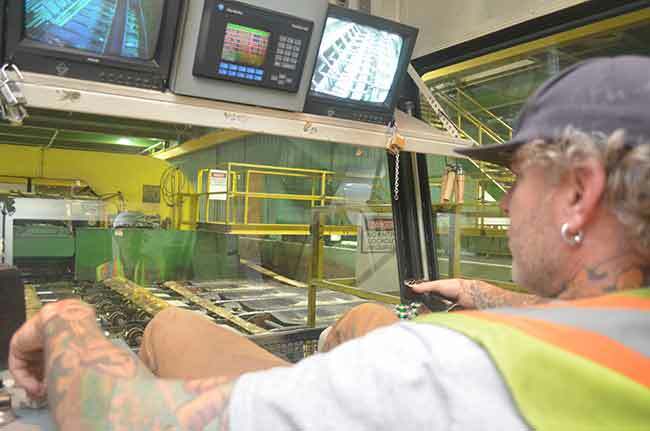 The mill still has graders that are making sure the machine is functioning properly and are closely following the grading performances to make sure their products still meet Gorman’s quality standards. “We still have check graders in place to ensure that the product going to the customer is right,” Griffin says. After the lumber is stamped, it is sent to the Mill Tech Industries lumber handling systems and piling chain. A Berg N Stark energy system burns dry shavings to provide energy for all of the company’s dry kilns. The Westbank facility currently has 21 dry kilns in operation, five conventional Wellons Kilns and 16 dehumidifier kilns manufactured by Custom Dry Kilns. “The dehumidifier kilns are lower temperature and very high humidity to reduce shrinkage and prevent drying defects,” Griffin says. So where does Gorman Bros. go from here, as far as upgrades go at its Westbank facility? “We’ll be looking for opportunities in edging in the rough green form,” Tracey says. He says the technologies for some of the scanners in the sawmill trimmer and edger optimizers will be requiring upgrades in the future. Ever-adapting since the days of working in the orchards, Gorman Bros. continues to plan ahead to help ensure bountiful harvests for its mill operations.